The Student PIRGs and Environment America, along with students across the country, will launch 50 campaigns in 15 states this year, imploring colleges and universities to generate 100 percent of their energy from renewable sources. CHICAGO: Today, McDonald’s released a new policy to restrict medically important antibiotic use in its beef supply chain. The company says it will immediately start measuring and assessing antibiotic use in its top ten beef sourcing markets. Then, by the end of 2020. McDonald’s plans to set targets for lower use of medically-important antibiotics. TAMPA, FL- All preliminary results point to a record breaking surge in youth voter turnout in the 2018 midterm elections. Students working with the Public Interest Research Groups’ New Voters Project made over 375,000 Get Out the Vote contacts in 11 states. Today, Congress set aside $5 million to renew the Open Textbook Pilot program for FY19, which gives grants to colleges and universities to promote adoption of free and open textbooks by professors. The program could save students up to $50 million! Today, Congress introduced its budget omnibus bill for the 2018 fiscal year, in which appropriators set aside $5 million for a program to lower textbook costs for students. In today’s long-overdue budget bill, Congress set aside $5 million for open textbook initiatives nationwide, which would replace high-cost publisher materials with free materials that can be accessed online or downloaded. 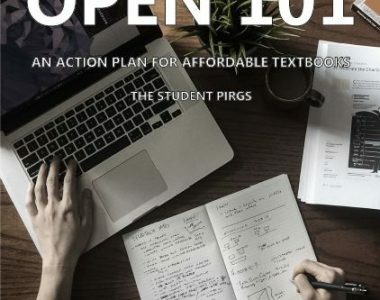 Student government leaders of the undersigned colleges and universities write to Congress on the urgent need to address the skyrocketing price of textbooks, and a request to create a national open textbook pilot grants program in the FY18 appropriations bill. This new report investigates high textbook prices for common courses at schools across the country and contains recommendations that, if enacted, could save students billions of dollars. The 2030 plan at Rutgers includes updates to University transit hubs, housing, student centers and athletic facilities, according to the master plan. With an overhaul of University systems set to take place, the new plan presents a unique opportunity for Rutgers to create a campus on the basis of environmental conservation.